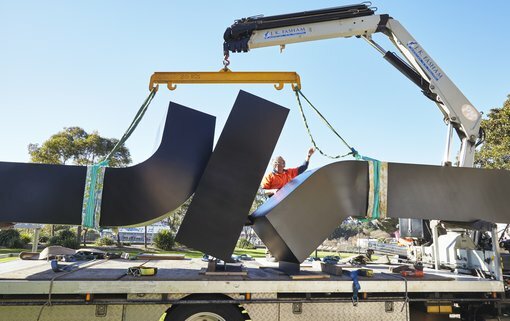 Meadmore’s monumental one-tonne steel sculpture Flippant flurry (1977-78) arrived at the Gallery yesterday following a ten-month restoration project in Melbourne to stabilise, repair and revive the artwork. Flippant flurry will take pride of place on the Gallery’s northern grounds, awarding it the recognition it deserves as one of the most vital and expressive sculptures in the collection. The seven-metre-long outdoor sculpture – one of Meadmore’s most iconic works – was purchased by the Gallery in 1979, shipped from New York and installed in the Gallery’s then sculpture courts. Since the 1980s Flippant flurry has been displayed at various outdoor sites surrounding the Gallery but effects of weather and strong light had taken their toll on the sculpture, corroding its metal and surface quality. Flippant flurry ’s recent treatment was made possible through the generous support of the Gallery’s conservation partner Macquarie Group, which funded the restoration and transportation of the sculpture. Art Gallery of NSW director Michael Brand said the Gallery is delighted to unveil the newly restored Flippant flurry . “We are committed to the safeguarding of artworks for the future by continually analyzing works in our collection with a team of specialists tending to them with the utmost care. Named after a famous musical piece by jazz composers Duke Ellington and Billy Strayhorn, Flippant flurry was created in the decade of the artist’s greatest success in the United States. Meadmore enjoyed one of the highest public profiles of any Australian sculptor of his generation. His works stamped the urban landscape with one of the most distinct sculptural visions of the last century. Meadmore was born in Melbourne in 1929 and later became a citizen of the United States. He died in New York City on April 19, 2005.